Don’t order baseline laboratory studies (complete blood count, coagulation testing, or serum biochemistry) for asymptomatic patients undergoing low-risk non-cardiac surgery. Conducting baseline laboratory investigations before low-risk non-cardiac surgery contributes little value to perioperative care. A focused clinical history and physical examination may reliably identify relevant abnormalities sought by routine laboratory testing before low-risk surgery. In addition, evidence suggests that abnormal results in this setting only rarely influence management and do not improve clinical outcomes. Preoperative testing may add value in the setting of a symptomatic patient or higher-risk surgery, but should not be performed routinely before low-risk surgery on asymptomatic patients. Committee on Standards and Practice Parameters, et al. Practice advisory for preanesthesia evaluation: an updated report by the American Society of Anesthesiologists Task Force on Preanesthesia Evaluation. Anesthesiology. 2012 Mar;116(3):522-38. PMID: 22273990. Czoski-Murray C, et al. What is the value of routinely testing full blood count, electrolytes and urea, and pulmonary function tests before elective surgery in patients with no apparent clinical indication and in subgroups of patients with common comorbidities: a systematic review of the clinical and cost-effective literature. Health Technol Assess. 2012 Dec;16(50):i-xvi, 1-159. PMID: 23302507. Keay L, et al. Routine preoperative medical testing for cataract surgery. Cochrane Database Syst Rev. 2012 Mar 14;3:CD007293. PMID: 22419323. Merchant R, et al. Guidelines to the practice of anesthesia–revised edition 2015. Can J Anaesth. 2015 Jan;62(1):54-67. PMID: 25323121. Don’t order a baseline electrocardiogram for asymptomatic patients undergoing low-risk non-cardiac surgery. 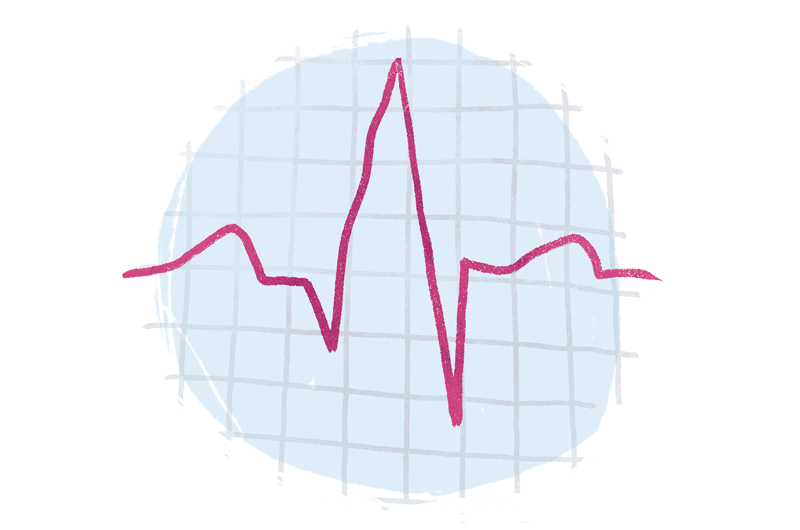 Electrocardiograms (ECGs) performed before elective, non-cardiac, surgeries are frequently abnormal. This is especially true when this test is done in older patients. Despite the frequency of these abnormalities, ECGs do little to improve risk prediction beyond simply asking patients about their health. Serious cardiac events like heart attack are rare following low-risk surgeries; there is little that physicians can do to further lower this risk. A preoperative ECG will therefore not improve outcome but may lead to more testing or treatment that is of little benefit. ECGs used to identify the cause of symptoms (palpitations, chest pain, dyspnea, etc.) remain useful diagnostic tools regardless of whether the patient is having surgery. Liu LL, et al. Preoperative electrocardiogram abnormalities do not predict postoperative cardiac complications in geriatric surgical patients. J Am Geriatr Soc. 2002 Jul;50(7):1186-91. PMID: 12133011. Mathis MR, et al. Patient selection for day case-eligible surgery: identifying those at high risk for major complications. Anesthesiology. 2013 Dec;119(6):1310-21. PMID: 24108100.
van Klei WA, et al. The value of routine preoperative electrocardiography in predicting myocardial infarction after noncardiac surgery. Ann Surg. 2007 Aug;246(2):165-70. PMID: 17667491. Don’t order a baseline chest X-ray in asymptomatic patients, except as part of surgical or oncological evaluation. While chest X-rays (CXRs) remain an important part of surgeon’s evaluation before cancer or thoracic surgeries, it is better if these staging examinations are complete before committing a patient to surgery. CXRs are not indicated in the routine pre–anesthetic assessment. In the absence of symptoms, CXRs yield few diagnoses and many false positives. CXRs do not improve risk prediction or stratification. CXR in the pre-anesthetic evaluation should be reserved for patients with symptoms consistent with acute cardiopulmonary illness (dyspnea, wheeze, productive sputum, etc.). Joo HS, et al. The value of screening preoperative chest x-rays: a systematic review. Can J Anaesth. 2005 Jun-Jul;52(6):568-74. PMID: 15983140. McAlister FA, et al. Incidence of and risk factors for pulmonary complications after nonthoracic surgery. Am J Respir Crit Care Med. 2005 Mar 1;171(5):514-7. PMID: 15563632. Don’t perform resting echocardiography as part of preoperative assessment for asymptomatic patients undergoing low to intermediate-risk non-cardiac surgery. Resting echocardiography has a clear role for resolving diagnostic questions in surgical patients, such as identifying the basis for suspicious systolic murmurs or new dyspnea on exertion. Outside these indications, resting echocardiography does not contribute significant additional prognostic information to usual clinical evaluation. It is not useful as a screening tool to identify surgical patients at risk for cardiac complications. Fleisher LA, et al. 2014 ACC/AHA guideline on perioperative cardiovascular evaluation and management of patients undergoing noncardiac surgery: a report of the American College of Cardiology/American Heart Association Task Force on Practice Guidelines. Circulation. 2014 Dec 9;130(24):e278-333. PMID: 25085961. Halm EA, et al. Echocardiography for assessing cardiac risk in patients having noncardiac surgery. Ann Intern Med. 1996 Sep 15;125(6):433-41. PMID: 8779454. Kristensen SD, et al. 2014 ESC/ESA Guidelines on non-cardiac surgery: cardiovascular assessment and management: The Joint Task Force on non-cardiac surgery: cardiovascular assessment and management of the European Society of Cardiology (ESC) and the European Society of Anaesthesiology (ESA). Eur Heart J. 2014 Sep 14;35(35):2383-431. PMID: 25086026. Wijeysundera DN, et al. Association of echocardiography before major elective non-cardiac surgery with postoperative survival and length of hospital stay: population based cohort study. BMJ. 2011 Jun 30;342:d3695. PMID: 21724560. Don’t perform cardiac stress testing for asymptomatic patients undergoing low to intermediate risk non-cardiac surgery. Stress testing can help resolve diagnostic uncertainty in surgical patients, such as determining whether individuals with chest discomfort and vascular risk factors have undiagnosed coronary artery disease. It can also help identify patients at elevated risk for cardiac complications after major vascular surgery. Nonetheless, asymptomatic individuals with good functional capacity have a very low risk of cardiac complications after low-to-intermediate non-cardiac surgery. Stress testing in such individuals is not useful for delineating expected perioperative risk and guiding clinical care. Etchells E, et al. Semiquantitative dipyridamole myocardial stress perfusion imaging for cardiac risk assessment before noncardiac vascular surgery: a meta-analysis. J Vasc Surg. 2002 Sep;36(3):534-40. PMID: 12218978. Sgura FA, et al. Supine exercise capacity identifies patients at low risk for perioperative cardiovascular events and predicts long-term survival. Am J Med. 2000 Mar;108(4):334-6. PMID: 11014727. The Canadian Anesthesiologists’ Society (CAS) established its Choosing Wisely Canada (CWC) top 5 recommendations by engaging a small team of expert Canadian anesthesiologists to develop research methodology and carry out a survey to establish the CAS top five recommendations. The survey was based on similar work done by the American Society of Anesthesiologists who identified an evidence-based list of activities to question within anesthesiology as Five Things Physicians and Patients Should Question: American Society of Anesthesiologists. The CAS team defined a short list of twelve tests and procedures in perioperative care and asked members of the CAS to consider each and answer questions about their frequency of use, impact on quality of the care for patients, cost of the investigation, evidence to support the investigation and potential to avoid ordering the investigation. Five recommendations were selected through survey data collection and analysis by the CAS research team in conjunction with a professional survey consultant and expert consensus. The top five were presented at the CAS Annual Meeting in June 2015 and will be published in the Canadian Journal of Anesthesia. Chest X-rays Before Surgery: When you need them and when you don’t Many people have a chest X-ray before they have surgery. However, if you don’t have signs or symptoms of a heart or lung disease you may think twice about having a chest x-ray. Common Tests, Treatments and Procedures You May Think You Need: Let’s think again The number of available tests and treatments in modern medicine is large and growing. But just because something is available, it doesn’t mean that we should use it. ECG (Electrocardiogram): When you need it and when you don’t An ECG (electrocardiogram) records the electrical activity of your heart at rest. Usually, you do not need an ECG if you don’t have risk factors for heart disease. Echocardiogram Before Surgery: When you need it and when you don’t Many people have a chest X-ray before they have surgery. However, the test usually isn’t necessary if you don’t have symptoms. Lab Tests Before Surgery: When you need them and when you don’t If you’re going to have surgery, you may have blood and urine tests first. But most healthy people don’t need the tests, especially before low-risk surgery. Choosing Wisely Implementation Guide: A Beyond the Mask Project Developed by Ontario's Anesthesiologists, this implementation guide was created to support anesthesiology departments in implementing the Canadian Anesthesiology Society's CWC recommendations.